Alan Committie is one of South Africa’s leading stand-up comics, character comedians, award winning actor, comedy writer, theatre director and Master of Ceremonies. His wealth of talent makes him a true comedy genius and a wealth of comedy information. He is renowned for his one man shows and his 950 plus performances in Defending the Cavemen. His most recent production, Love Factually, played to full houses both in Johannesburg and Cape Town. He is regarded as one of the hardest-working comedy actors in the country. Alan is a born and bred Capetonian and was a school teacher in another life. On the Cape Town Funny Festival, Alan is the genius master of ceremony, who holds the show together. 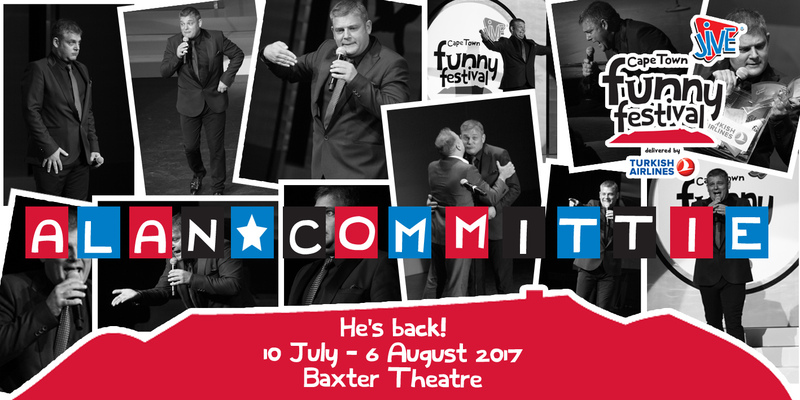 Alan Committie is a comedy favourite with so many South Africans. He is a true master of his art.